In everyday life our mind is filled with endless thoughts, roughly 60,000 every day. Memories of pains and pleasures, regrets of things we wish we hadn’t done or wish we had, things we wish we had said or hadn’t, things we will say or do in the future, etc., fill our days. Most of our days are filled with struggle, uncertainty, doubt and confusion. We believe that without these thoughts, nothing can be accomplished, that we will be unhappy and unsuccessful in "life" and even in danger for our very survival. We believe that we are our thoughts and so do this thinking, thinking, thinking from when we wake up until we fall asleep and even in our dreams. Unfortunately, this approach, as we all know, is unsuccessful; the stream of thoughts just doesn’t deliver the happiness and peace we want. Pleasures are short-lived, and never measure up to expectations, requiring more thoughts and greater effort, and more disappointments in the pursuit of the elusive lasting happiness. "It is within your competence to think and become bound or cease thinking and thus be free." Isn’t there a better approach to happiness, one that would make it possible for you to live a sane and holistic life while fully engaged in the activities of today's world? What if you could dramatically slow and perhaps stop the constant stream of thoughts? What if you could live with only occasional thoughts in a heightened awareness that is fully alert, aware and functional, and yet calm, peaceful and happy? Thoughts would still be available for certain tasks, but they are now an instrument in the band, not the stressed-out, confused solo singer and guitar. “Mental” tasks, when they occur, are done with greater insight, clarity and perception as they no longer have to fight their way through unending competing stream of thoughts. If you look at when you have had a unique insight, inspiration or revelation, an “ah ha” moment of stillness and clarity, that is what we do in this work – make such occurrences more likely. In fact, that becomes your principal state of being. How do you free yourself from thoughts? "To be free from thoughts is itself meditation. You begin by letting thoughts flow and watching them"
There are many tools to work with, some contemporary, some intuitive, others ancient and classical. They use practices such as yoga postures, breathing exercises, chanting, meditative inquiry, affirmations, and negations. The linked pages are abstracted from Gary Weber’s book “Happiness Beyond Thought: A Practical Guide to Awakening.” Many other approaches are covered in the book including simple thought exercises, surrender, chakras, diet, recent scientific studies validating the work, reasons for practice, sitting meditation, what awakening is like and what it isn’t, background texts including Ramana Maharshi’s Upadesa Saram, Shankara’s Nirvana Shatakam, and selections from the Bhagavaad Gita, and many dialogues and discussions with students. A table of contents is in the book link. Much of the work focuses on watching thoughts in different situations and investigating their structure. These approaches have been used for thousands of years and have been rediscovered by virtually every culture. It is not necessary to change your name, clothing, or hairdo, adopt some strange customs, travel to a distant location, retire from the “world”, stop working, or give away one’s possessions to engage in this work. Gary continued his practice and “awoke” while having a family and working successfully in research institutions, industry and academia. He continued working successfully afterwards for many years. There are many resources available. Websites for background are at www.ramana-maharshi.org , www.adyashanti.org, www.innerdirections.org , www.advaita.org , and www.theopensecret.com . Books written by or about Ramana Maharshi (The Spiritual Teachings of Ramana Maharshi), Nisargadatta Maharaj (I Am That), Bassui (Three Pillars of Zen), Douglas Harding (Look for Yourself), Tony Parsons (As It Is), Adyashanti (My Secret is Silence), and advaita vedanta are useful. These folk range from contemporary and 14th century Zen masters to 19th and 20th century Indian sages, 20th century European musicians, and contemporary English philosophers. A more complete list is found in “Happiness Beyond Thought”. Contact Gary Weber if you have any questions, comments, want to know the schedule for classes, workshops, book signings, or for more information. Gary shares this work through weekly small group meetings, larger monthly workshops, 1/1s, and by e-mail. 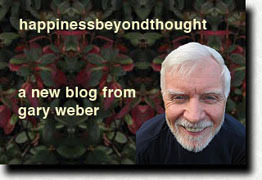 Gary Weber has been a practitioner and teacher of yoga, meditation and non-dualist philosophy for over 3 decades. He has studied many schools of yoga and meditation with many teachers in many places.